Surah al-Fatiḥah - The Opener: The Exegesis of First Surah / Chapter of the Holy Quran ~ Islam My Ultimate Decision . 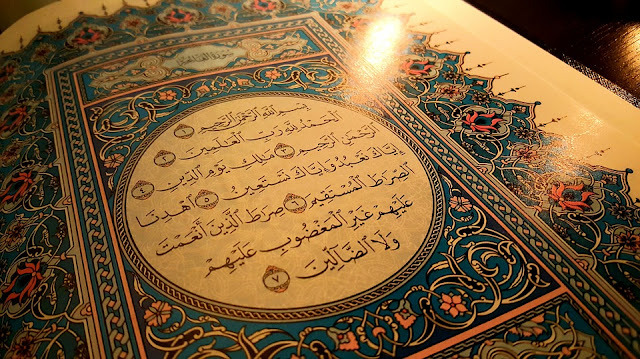 I have already mentioned in one of my earlier posts that The Holy Qur'an has divided into Thirty Parts, called Juz in Arabic and each part consists of either a single or number of Chapters, called Surah in Arabic. From this post onward, I intend providing summary of each chapter, while will give reference for its complete reading both in Arabic and English. Also where available, will also share video of the chapter with English translation. Today we begin with the First Juz / Part of the Holy Qur'an which begins with the Opener called Sūrah al-Fātiḥah. 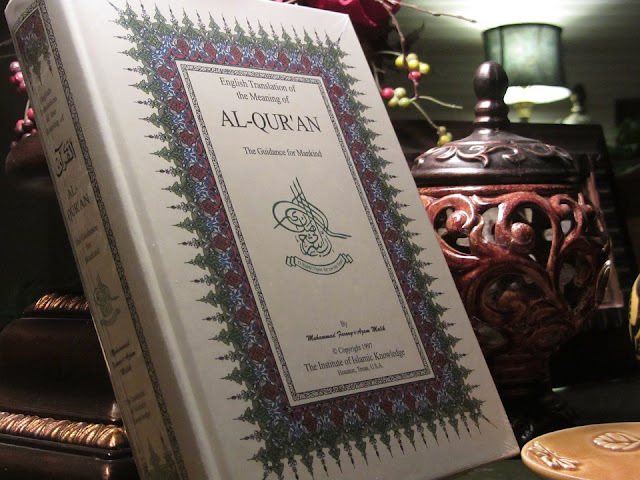 It has seven verses and leads all chapters of the Qur'an that follow it. Prophet Muhammad (peace be upon him) has been oft quoted as saying: "By Him in Whose Hand is my soul! Allah has never revealed in the Tawrah (Torah), the Injil (Bible), the Zabur (Psalms) or the Furqan a Surah like Sūrah al-Fātiḥah. It is the seven repeated verses that I was given." The word al-Fātiḥah الفاتحة came from the root word فتح which means to open, explain, disclose, keys of treasure etc. That means Sūrah al-Fātiḥah is the summary of the whole Qur'an. Sūrah al-Fātiḥah is considered as the Umm al Quran (Mother of the Holy Qur'an) or should we the substance of the Holy Quran. Sūrah al-Fātiḥah is considered to be divided into three parts: In the first part, Allah speaks about Himself in the first three verses. All that exists in this Universe belongs to none but Allah. Perhaps in times of revelation of Qur'an and times before, people could not imagine the vastness of the inverse. It is now with the Hubble Telescope in the space that scientists and spacemen have started to explore the universe, but this seems a tip of the iceberg as the universe that Alla h has crated has no bounds and Allah alone is the master of what all that exists. Allah is Beneficent, the generous and benevolent, and most Merciful. Unlike the notion that some people lament the wrath of Allah, the opposite is the true. He is Beneficent and Most Merciful beyond one's imagination. He let go many unpunished and gives them enough concessions to come back to the righteous path. It is only those who transgress beyond the tolerance limits that are finally punished. And for such transgressors Allah has kept a Day of Judgment when all those who tested the limits of tolerance and violated His commandments will be punished, while those who asked for mercy and begged forgiveness will be rewarded abundantly. Please read a detailed post on the two attributes الرَّحْمَنِ الرَّحِيمِ mentioned in the first verse here. Allah has mentioned His sovereignty of the Day of Resurrection, but this does not negate His sovereignty over all other things. For Allah mentioned that He is the Lord of existence, including this earthly life and the Hereafter. Allah only mentioned the Day of Recompense because on that Day, no one except Him will be able to claim ownership of anything whatsoever. On that Day, no one will be allowed to speak without His permission. Reading all the holy scriptures, the Psalms, Torah, Bible and Qur'an, the scholars conclude that all prophets and messengers of Allah always worshiped one omnipotent Allah and sought help to put the people they were sent on the righteous path - the path of truth that straightaway leads to pleasing Allah. Now a word about the "Ihdinā ṣ-ṣirāṭa al-mustaqīm" Show us the straight or the right path. Many scholars believe that ṣirāṭa al-mustaqīm is the middle path - the path winch is pure from innovations or matter that create doubts in one's mind. Doubtful are the matters that are a gray area between right or wrong or good or evil. So a true believer prays that he be shown the ṣirāṭa al-mustaqīm so that he does not go astray and follow innovations which though look apparently good, have evils strings at the back. As for the meaning of As-Sirat Al-Mustaqim, it is the clear path without branches, according to the language of the Arabs. For instance, Jarir bin ` Atiyah Al-Khatafi said in a poem, ` The Leader of the faithful is on a path that will remain straight even though the other paths are crooked.'' At-Tabari also stated that, "There are many evidences to this fact.'' At-Tabari then proceeded, "The Arabs use the term, Sirat in reference to every deed and statement whether righteous or wicked. Hence the Arabs would describe the honest person as being straight and the wicked person as being crooked. The straight path mentioned in the Qur'an refers to Islam. This part needs a little elaboration and has many versions in its interpretation. The Holy Qur'an as a whole has three main portions, one third is about Allah, one third about all the prophets and the holy scriptures and the remaining about Halal and Haram. We speak of the greatness of Allah and His endless benevolence and forgiveness, we know too that the transgressors cannot be left free for what they did when the had time to do good but did otherwise and did not fear Allah. Thus the last of the two verses speak of three kind of people the prophets prayed either to be part of or otherwise. The second type of people one prays not to be of any part are the people who faced the wrath of Allah (not of those who have evoked (Your) anger) for their misdeeds and disobeying their Lord like children of Israel, the Jews who abandoned practicing the religion and instead started to find faults with the last religion of Allah sent through Prophet Muhammad (peace be upon him) - while in fact the religion of Islam has many commonalties with the commandments revealed unto Prophet Musa (Moses, peace be upon him). In nutshell, Sūrah al-Fātiḥah is a wholesome prayer that each Muslim recites in every cycle of the daily five prayers begging Allah to lead him to the path of the blessed and not the path upon whom the earth of the Lord of the Universe fell or those who digressed from the straight or right path and got astray. I hope this post adequately explains the opening chapter of the Holy Qur'an, its meaning and purpose and how to easily learn to recite it.